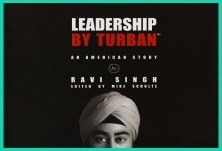 After 9-11 Ravi Singh talks about his struggles to wear a turban in America while highlighting principles of leadership that he has learned along the way. An American story about a young man seeking to balance his religious identity in America. Each chapter inspires you both on what it means to be a SIkh in America. Leadership by Turban is a true story about a young man seeking to balance his religious identity in today's America. "Do not store dreams in your eyes, they may roll down with your tears. Store them in your heart that each heart beat will inspire you to fulfill them."